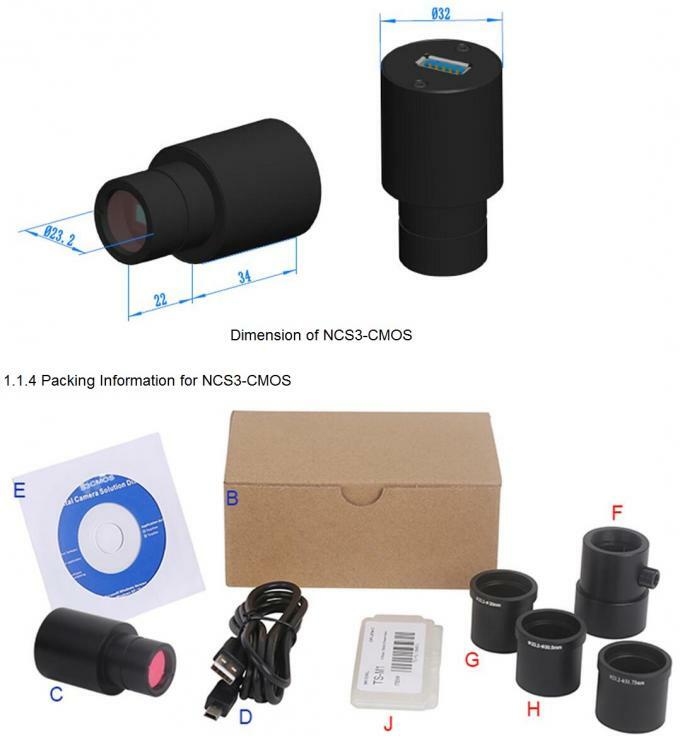 NCS3-CMOS is an economic version with simple and compact structure USB3.0 CMOS eyepiece camera. So here, the S means simple and compact. USB3.0 is used as the data transfer interface. The NCS3-CMOS can be widely used to transfer the mono or binocular student microscopes to digital microscope. With 23.2 to 30mm or 23.2 to 30.75 convert ring, the NCS3-CMOS camera can also change the stereo microscope to digital stereo microscope. The NCS3-CMOS body, made from aluminum alloy blackening, ocular housing: Dia.32 X 56mm ensures a heavy duty, workhorse solution. The camera is designed with a high quality IR-CUT filter to filter the infrared light and protect the camera sensor. No moving parts included. These measures ensure a rugged, robust solution with an increased lifespan when compared to other industrial camera solutions. Image Stitching Image stitching can automatically combine a sequence of relevant images into a perfect larger one. No requirement on the image order；Support video window, image window, browse window image stitching operation. Image Stacking Image stacking adopts advanced image matching technology. With the recorded video, regardless of shifting, rotation, scaling, the high fidelity image can be stacked to decrease the image noise. Color Composite Color composite adds appropriate pseudo color to monochrome fluorescence images. Fluorescence probe and color can be chosen from the pre-defined database. Dye database can also be easily created for special fluorescence probe.